The past few weeks have been a bit hectic, but a lot of fun and I’m sure that the next couple of weeks will be too. Last month I went to London and a couple of days ago I returned from a trip to New York. Tomorrow I’m taking the train down to San Diego for a shopping trip with my girlfriends and next week I’ll be spending Thanksgiving with my parents in Las Vegas. While I am loving the time off and the opportunity to travel, I have not had much time to cook and, as I am sure you have noticed, post entries to my blog. Finally, today, I had a couple hours to myself and I chose to do some baking. I needed something that would be quick and easy, to get me back to the swing of things in the kitchen. 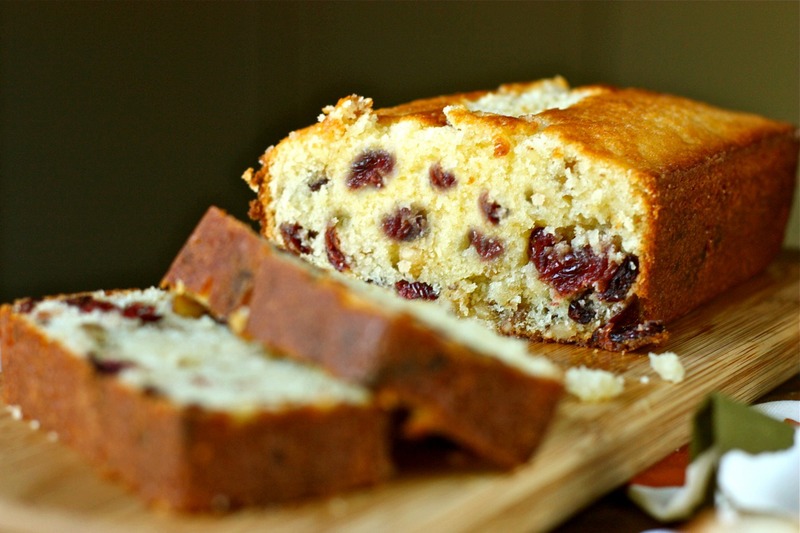 What came to mind was this Cranberry-Orange Walnut Bread. If this recipe seems a little familiar to some of you, it is because I adapted it from the Red Currant and Poppy Seed Cake recipe I posted a couple of months ago. I love this bread because it is so moist and flavorful. It is a wonderful base to which to add seasonal ingredients or whatever happens to be in the pantry. This time around, I added chopped walnuts and dried cranberries, which I rehydrated in a little bit of Grand Marnier to get them fat and plump. Make this ahead and serve it Thanksgiving morning to keep the troops happy and out of the kitchen. Heat the oven to 350 degrees F. Grease and flour a 9″x5″ loaf pan and set aside. Whisk the flour, baking powder, salt and set aside. Stir the sugar and the orange zest together until well-combined and fragrant. Using a stand mixer with a paddle attachment, cream the butter and sugar/zest mixture together until light. Add the vanilla and orange extracts. Add the eggs one at a time, mixing well until thoroughly incorporated, scraping down the sides of the bowl as needed. Add the flour mixture in two additions, alternating with the buttermilk. Process the batter until smooth, about 15-20 seconds. Fold in the chopped walnuts and kicked up cranberries. Pour the batter into the pan and bake until the cake is firm and a tester inserted into the center comes out clean, about 50-60 minutes. Yes, we definitely have to meet up at some point. It seems like you visit Seattle quite a bit, so maybe we can meet there. I haven’t had a chance to visit there recently, but maybe it could work next time you’re there. There are so many restaurants I’d like to visit up there. What a splendid bread for November and the Thanksgiving holiday! The pairing of cranberries and orange is stellar!